The usual anonymous commenters accused me of making it up. Quelle suprise. Quite why anyone would read this blog if they thought I habitually did that, I have no idea, but I digress. Labour heavyweight John Reid has told Gordon Brown that he should consider quitting, the Standard has learned. The former home secretary refused to categorically deny that he had told the Prime Minister that he should consider standing down. If Mr Reid has issued such a warning, it would be a bombshell intervention as he would be the most influential MP currently calling for Mr Brown to go. Downing Street sources sought to play down the significance of a private meeting between the two men by insisting that they had spoken mainly about football. The talks are said to have taken place in Downing Street. A No 10 source confirmed that Mr Reid and Mr Brown had met but said it was “rubbish” to say that they had discussed the leadership. Mr Reid dismissed reports of the alleged conversation as “inaccurate”. 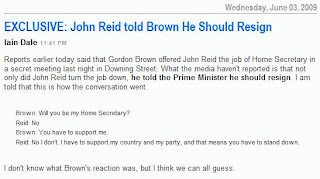 After this was repeated on another blog, Mr Reid's office this morning issued a statement saying: “They are not an accurate account of the conversation between the Prime Minister and John Reid.” The Standard, which has also been told by a Labour source that a conversation along these lines took place, then put the following questions to his office: Did John in any way suggest to Gordon Brown that he should consider standing down? And did they discuss the leadership? It's interesting that there is no categorical denial from Reid. Using the word "inaccurate" sends the signal that the words may not be 100% accurate but the content was. The story is important for several reasons. John Reid is a highly respected former cabinet minister. He speaks for a significant section of the Labour Party. And he had the bravery to do what few others have done. His intervention, which he has not denied, could be a game changer. Could Reid's words act as a spur to others to have courage? After all, courage is something the Prime Minister admires. In others. Evening Standard Column: Who will step in to rescue May’s Brexit?